"Theater is one of the odd professions where you can find an above average percentage of middle-age couples without kids, and it often seeps into what we eventually see on the stage." 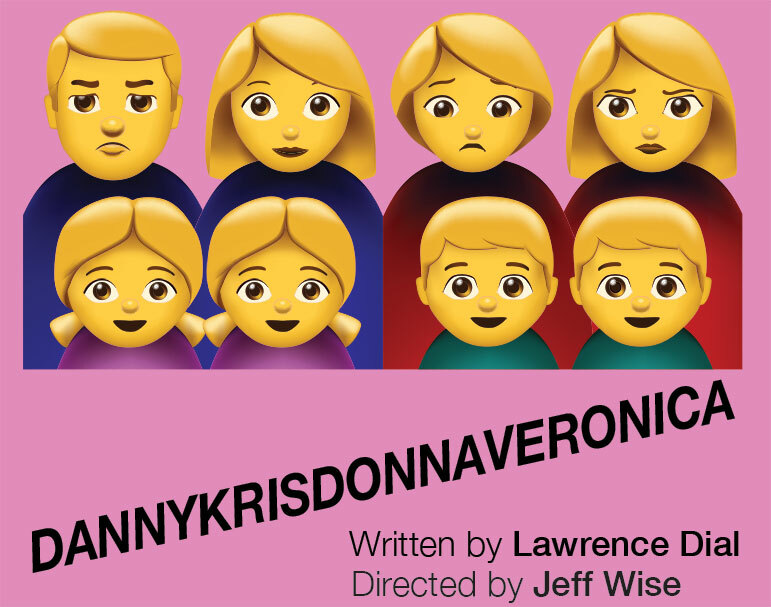 What is your play DANNYKRISDONNAVERONICA about? I wrote DKDV in response to two great plays I’d seen earlier that year: DETROIT by Lisa D’Amour, and THE REALISTIC JONESES by Will Eno. 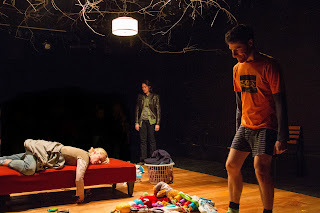 Both plays featured two heterosexual couples coming together, becoming friends, and collectively dealing with life issues. I loved each play, but upon introspection there was an obvious omission: neither play even remotely mentioned children. I thought ‘In what world could four married heterosexual couples throughout two different plays, each character in their mid to late thirties, not at some point when discussing various life issues, mention children?’ I know a lot of mid-thirties couples who do not have kids, but all of them mention it quite often, but lament that because of their choice to pursue theater, doubt they’ll never be financially stable enough to raise a family. In truth, theater is one of the odd professions where you can find an above average percentage of middle-age couples without kids, and it often seeps into what we eventually see on the stage. 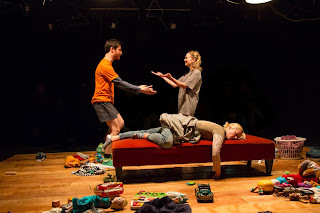 I have two children, and the premise for DKDV at first seemed very simple: write a play with two married couples (a later draft nixed the heterosexual part) dealing with life issues while ALSO being parents. I looked to DINNER WITH FRIENDS for inspiration, but didn’t relate to the class-level of that play (they’ve got a goddam summer house—who’s got a summer house? ), and also, GOD OF CARNAGE, but felt uncomfortable with that play’s missing kindness I’d experienced from almost every parenting couple I’ve ever met. 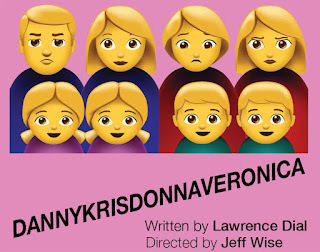 So the formula for me was PARENTS + CHILDREN + LOWER/MIDDLE CLASS + KINDNESS = DANNYKRISDONNAVERONICA. I added the setting of a Brooklyn Park, and then waited to see what happened. If you’ve ever tried to write a play with kindness in mind, real quick you realize kindness and drama do not go together. So I struggled for two years with it. It was harder to write than I prefer. Oh man, this is a long story I’ll try keep short, and not talk too much smack. I had gone up to YALE to interview for their playwriting program, and the first interview with Jeanie O-hare went amazing; she seemed to like the play, and enjoyed that I was writing about parents and the difficulty of parenthood etc. It was very encouraging. I wasn’t entirely sure how I was going to move my family up to New Haven, have my wife quit her job, re-enroll my kids into another school etc… but she didn’t seem super fazed by this, and the interview ended positively. Next, I met with Sarah Ruhl, and the entire experience was like slowly letting air out of a balloon. And I told her, and then somehow answering her own question she hadn’t yet asked, she responded with “Yeah, I married a doctor…” The subtext was That’s how I survived. I got the hint fast, and became a little gloomy, because Sarah’s got her own kids, and I had expected us to bond on this, for her to have loved my play about the difficulties of parenthood, but what she was showing me was she felt threatened somehow. Or was just unable to disguise how doomed she believed I was. Which I get, honestly. Being a parent and a playwright and living in NY—it’s doom. And most grad schools don’t want doom in their programs; they want diversity of voice, and ease. They want the safest bets they can place, and a stay-at-home parent is not one of them. But at some point Sarah says: “Talk to me about your title. What’s up with it?” I tell her it’s called THROUGH THE TREES, which is part of the saying 'You can’t see the forest through the trees.' the idea being you’re too close to a thing to see what it actually is. 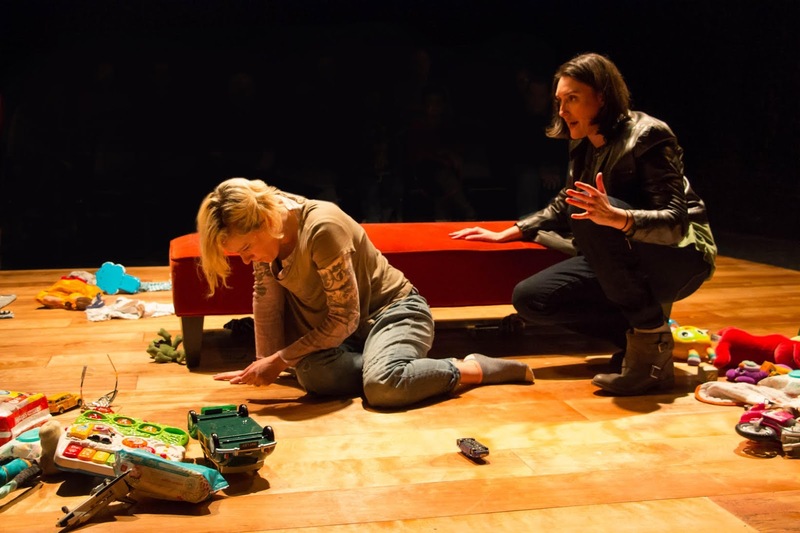 Which I thought was a wonderful metaphor for the conflicting emotions parenthood can inspire (there’s also a fallen tree in the play; wind through the trees etc.). She shook her head slightly, nope. “It’s doesn’t have the heart of your play in it. It doesn’t capture what your play is about.” Uh… I mean, what do you say to that? This is Sarah Ruhl telling a perspective grad student, a playwright who is so excited just to be sitting in New Haven even being considered for this program, that his title doesn’t work. I’d like to say that I didn’t change the title from THROUGH THE TREES to DANNYKRISDONNAVERONICA entirely because of Sarah Ruhl (nevermind if it’s even a better or worse title or more fully captures the heart of the play), but she’s probably part of it. I left the interview and bought a six-pack and rode the train home; I was not surprised when a three-sentence form-letter rejection showed up in my inbox a week later. I think Sarah’s a great playwright, and I imagine an even better mother, but I can say with confidence she’s a reckless interviewer, and I can’t speak on her abilities as a teacher. How did you hook up with Wheelhouse Theater Company? 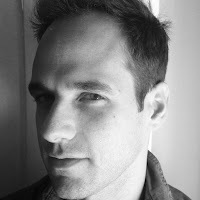 Only three months ago I had another play up called IN THE ROOM, and we had cast Matt Harrington in the lead male role. Matt’s a great actor, and a founding member of Wheelhouse Theater Company, who were looking for another producing credit, and we were glad to have them onboard. Near the end of the run on the show, Jeff Wise (one of Wheelhouse’s Artistic Directors) came to me and asked if I had any other plays he could consider for production. At the time I didn’t realize that Jeff was a stay-at-home father to three kids, and skeptically I forwarded him DKDV, not really thinking he’d be very interested in it; it’s very different than IN THE ROOM. But he read it and love it, and I encouraged him to direct the production based on his presence during IN THE ROOM, and the insight he could bring to these characters I’d written. I’m not sure anyone else could have seen what I was going for with this play, other than Jeff. When I’m working on a project I’m writing six days a week, and I’m usually working on something. Only when I’ve got a play in production do I slow down. Or between projects sometimes. But generally, more than anything, I enjoy writing and love getting lost in it. Kids do it for you. It becomes very easy to see what little time you have available after you have children. You can look at your day and see the exact time you have to write, and that’s useful because you know if you don’t do it right then, it won’t happen until the next day. 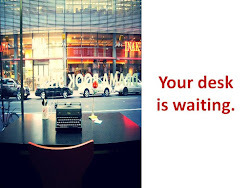 With DKDV (roughly four years ago) both my kids were home with me all day, and I was writing only about 45 minutes or maybe an hour and half each day. So it took a while, around two years. I remember lamenting this to Stephen Guirgis, and he told me he had a buddy who wrote a whole novel at only one hour per day. And sometimes, that’s really useful. When you can’t move too fast, it forces you to slow down and think about each interaction with great detail. But you can also get bogged-down this way, and stop seeing the bigger picture of what you’re writing. So you have to find the right balance. I think I value perseverance over talent or success. I enjoy my friends' work the most. I’m inspired by the off-off Broadway plays that mostly go unnoticed by the big names out there. Struggle inspires me, I think. I HAVE TO WRITE A TELEVISION PILOT. There’s no way I can sustain playwriting and a family without another income, and my waiter job is killing me. So this year I’m focusing on TV. And maybe a play about a climbing gym. Or a driverless car.